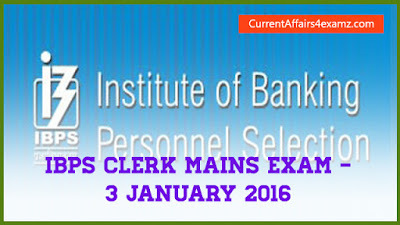 Hi Aspirants..Today (3 January 2016) was the second day of IBPS Clerk Mains 2016. In this post we are sharing with you the questions asked in the Morning Shift of today's (03.01.2016) exam. The Mains Exam consist of Reasoning, English, Quantitative Aptitude, General Awareness & Computer Knowledge. 40 questions from each section for a total of 200 marks. This will be useful for those preparing for next year's exam.